The door opening alarm circuit or “Front Office Visitor Alert” is used for alerting you when a customer is at your office/shop. It will produce a beep sound when each new customer or visitor is entering, and will automatically switch OFF after few seconds. 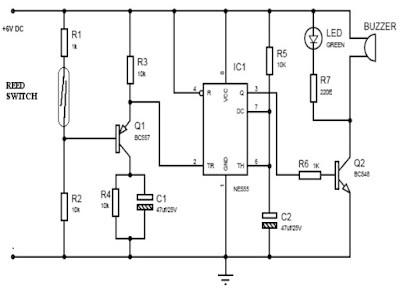 In this circuit timer IC NE555 is used as monostable mode. Initially when the door is closed; reed switch (normally open type) near the magnet is closed. When the door is opened by someone, the reed switch near the magnet is open and the base of Transistor Q1 goes low through the 10k Resistor R2, and so Transistor Q1 is ON. At this time trigger pin 2 of the IC1 go low, it triggers the monostable built around IC NE555. Once triggered, output pin 3 of IC1 goes high, and both Buzzer and LED are turned on. At this time the Capacitor C1 starts charging through the Transistor Q1. After few seconds the Buzzer and LED will automatically switched OFF. When the door is closed the T ransistor base become high, Transistor Q1 goes OFF and the Capacitor C1 starts discharging through the Resistor R4 is connected parallel with the capacitor C1. You can change the time period of IC1 by changing the values of resistor R5 and capacitor C2. 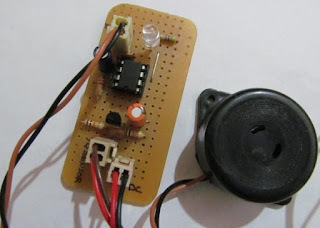 Assemble the circuit on a general-purpose PCB, enclose in a suitable cabinet and the magnet is fixed on the door frame and the reed switch is fixed on the door, near the magnet. 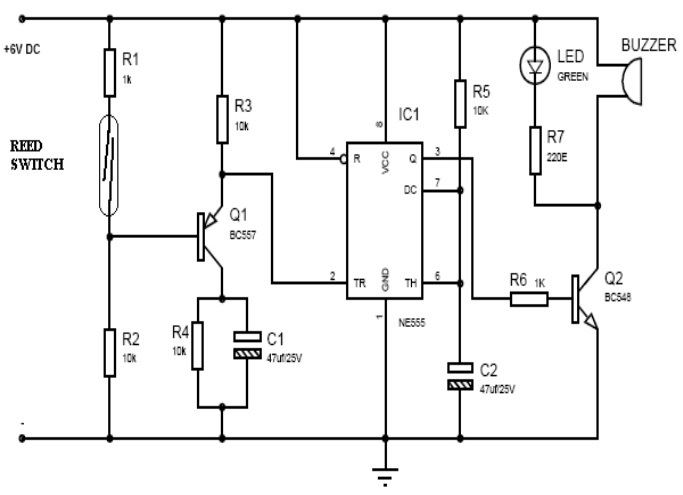 The circuit can be powered from a 6V battery or from mains by using a 6V power adaptor.